GM has announced that they will be halting production of the Chevy Volt plug-in hybrid this May in order to “prepare for the new model generation.” Yes, that is one reason why they are stopping production, but there is another, more important reason. Chevy currently has a 210 day supply of Volts waiting to be sold. The ideal supply for an automaker is 60 days. This is 3.5 times that, which will be a burden on dealers to move through before the new car goes on sale. That means that a lot of incentives and discounts will probably be coming to the current Volt before the 2016 model goes on sale. Sales of the Volt have declined every year since 2012, and are down 48 percent for the year so far. Not ideal. Of course, these falling sales have a lot to do with the sudden drop in gas prices that has made consumers want more SUVs and fewer small hybrids. While China is dominating car sales and Russia is faltering like nobody else, India seems to be chugging along just fine. Sales in India were up 3.9 percent last month thanks to heavy demand for cars from Maruti, Hyundai and Honda. It’s encouraging since there have now been 2.6 million cars sold for the 12 months leading up to the end of March when auto sales were actually down 6.1 percent the year before. Unlike China and its newfound SUV love affair, India is buying as many small cars and hatchbacks as it can. Sounds like our sort of market. Do you own a new Viper? Who am I kidding, of course you own a new Viper. Well, I have bad news for you: It’s being recalled. Apparently there have been three warranty claims regarding doors failing to close or opening at fairly low speed, so Dodge has decided to recall 2,486 cars to change their door handle assemblies. Apparently a sealant that was used in the process is to blame. So, everyone, bring in your Viper and get it fixed so your door doesn’t fly open and hit one of the other Vipers parked along your street. In the wake of a $150 million payout to a family that had their four-year old die in a Jeep fire, NHTSA is looking into reopening a probe into rupturing Jeep fuel tanks. In 2013, Jeep recalled 1.56 million vehicles to repair their fuel tanks. As of right now, 388,000 cars have gone through the process. That’s about a fifth of the cars that were recalled. Of course, Jee and NHTSA cannot force the remaining 1.2 million cars to come in and get fixed, that’s impossible. But the investigation would be reopened to look at missteps along the way during the recall and what could have been done better. Lexus will be showing an updated ES at the upcoming Shanghai show, once again putting an emphasis on the importance of the Chinese market. Of course, the new ES has a “more dynamic experience,” which is a requirement in cars these day, dontcha know? On this day in 1879, Sandor Herz—the future John Hertz, the man behind what will one day be the world’s largest car-rental company—is born in present-day Slovakia. 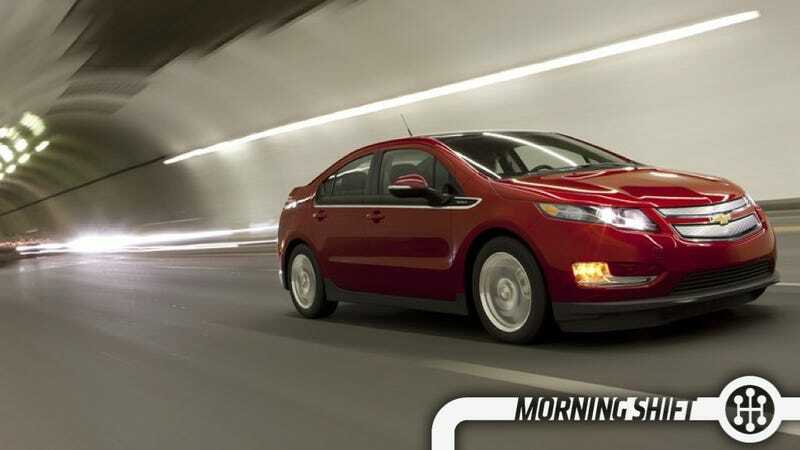 Will the next Chevy Volt be more of a hit than this one?